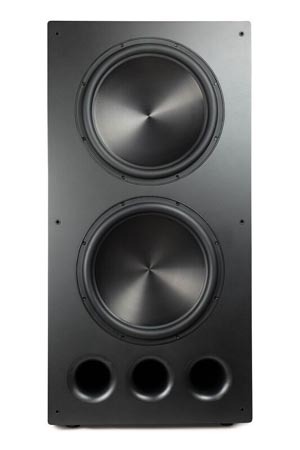 FV25HP is our answer to the need for a high power home theatre solution that retains the dynamic and accurate bass that we have become known for. Correctly integrated, our vented subwoofers can achieve the tight bass normally associated with a sealed enclosure, yet with greater low frequency output. 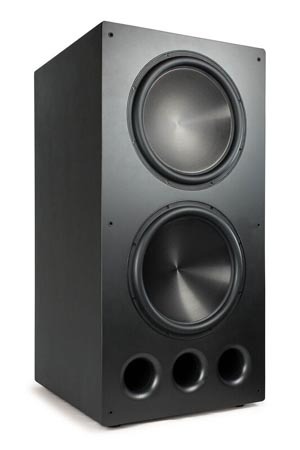 We recommend this subwoofer for systems in which home theatre has a high priority. Dramatic reduction of the re-radiation of bass from inside the box, which is commonly referred to as boxy bass. FV25HP comes with a grille. The above photo is shown with grill taken off. It uses our new high power HX2000XLR3 servo amplifier and two DS1520 driver. DS1520 features anodized aluminum cone, a 3" voice coil, and 200 oz magnet. Its linear excursion range has increased to +/- 20mm. The standard amplifier is HX2000XLR3. The quickguide of the XLR3 amplifier for vented subs can be found here . The installation guide can be found here. The response curves with various extension frequency/damping combinations of both amplifiers can be found in our EQ page. The sub comes with standard screw-in rubber feet. Chrome spike feet are sold separately. Price includes freight shipping to 48 US continental states only. Shipping to other region or country should inquire us for actual cost. Each FV25 sub comes with complimentary mover pads for either carpet or hard floor, but not both. Please be sure to select one.